The fattest book on my shelf of MT books is Mark Twain Speaking, Paul Fatout's edition of his collected lectures and dinner speeches. 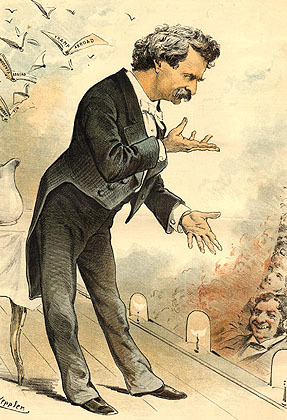 In his time, "Mark Twain" stood for a stand-up performer as much as for an author. Between 1867 and 1909 he appeared before hundreds of audiences, and perhaps over a million people, in lyceum halls and banquet rooms, in small American towns and big cities, in London and the outposts of the British Empire. His live performances not only played a major role in shaping the world's perception of him; performing a self is one of the central preoccupations of his written work, especially the fiction.